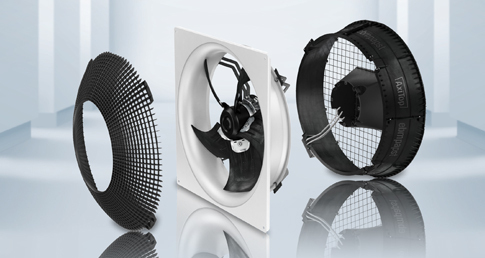 Whether it’s heat pumps in the home, condensers in supermarket refrigerators or ventilation systems on the production floor, FlowGrid, the innovative patent-pending air-inlet grill from ebm-papst, is dramatically reducing noise levels for fans installed within limited-space air moving equipment. These turbulences then hit the rotating blades of the fan, generating noise – specifically a broadband noise and additional narrowband, tonal frequency components, known as propeller noise or tonal noise. 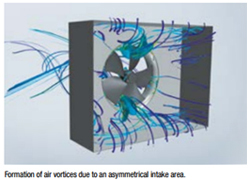 Mounted on the air intake side of the fan, the FlowGrid weakens these ‘vortex strings’ as they flow through the device. This reduces sound pressure across the entire sound frequency range and especially in the low frequency tonal range. Apart from reducing overall sound pressure, the most drastic reduction is in low-frequency blade-passing noise (the sum of the fan speed and the number of blades) caused by blades cutting through turbulence within small space applications such as heat exchangers. The FlowGrid grill has been proven in certain applications to reduce overall sound pressure levels by as much as 3.9 dB(A), and these blade passing frequencies by up to 16 decibels. With FlowGrid, ebm-papst is making a clear contribution to passive noise reduction – a big part of our GreenTech philosophy. It can help manufacturers and ventilation specifiers comply with noise regulations and improve the environment for employees who work near ventilation equipment. 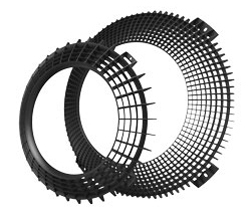 The innovative air-intake grills, which require less acoustic insulation, work with both axial and centrifugal fans without reducing their performance. 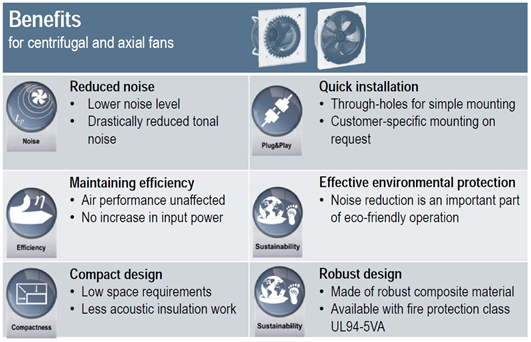 Using them can help to reduce or entirely avoid the use of cost-intensive, active noise-reduction measures. For additional information about how FlowGrid can make a difference in your application, contact one of our application engineers today at 860 674-1515 or sales@us.ebmpapst.com.